As they were so popular last year, I thought it would be fun to offer some more Limited Edition 40 minute Christmas Mini Sessions at our studio, I am only offering a limited number of sessions at this price, I would really recommend booking a slot before they are all taken. I would hate for you to miss out. With our Christmas Mini Sessions, it is for Children only and we will have 3 setups to choose from, one of which will be an outdoor option if the weather is good, and the other two will be indoor. The main focus will be on the Christmas sets but once those are done, we can also take a few shots on a neutral background or outdoors if you prefer. 1. Payable upon booking and your time slot will not be held for you until your session fee has been paid in full. You can opt for the £150 package on booking and choose to upgrade once you have seen the images if you wish. 2. The fee cannot be refunded in the case of a no-show but if you know in advance that you can’t make it, and can find someone else to take your place, please let me know asap. 3. Turnaround for digital images is no more than 2 weeks. 4. The 10 images to choose from are dependent on the willingness of the child. For mini sessions, I am unable to offer reshoots or refunds if a child doesn’t cooperate. 5. If you arrive late to the session, it will eat into the amount of time allowed so please endeavor to arrive on time. 6. Gift vouchers, Discount Vouchers or Referral vouchers cannot be used in conjunction with this offer. 7. Christmas Mini Sessions are not suitable for Newborns so Babies must be sitting independently for these sessions. 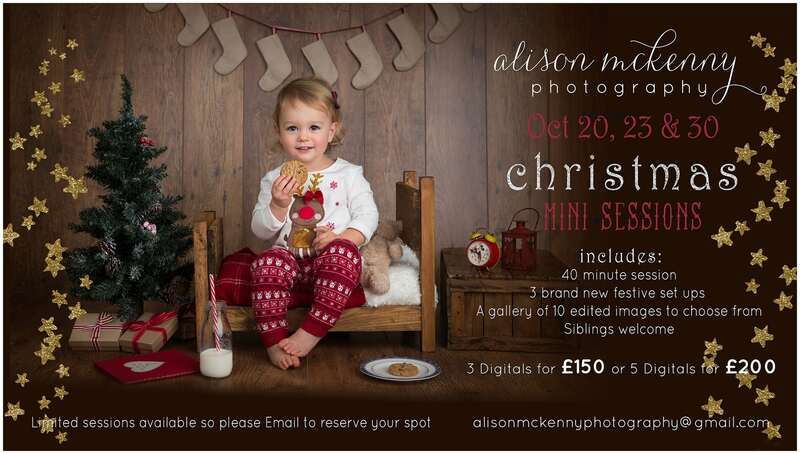 This entry was posted in Alison McKenny Photography Studio, Christmas Mini Session, Mini Session, Toddlers and tagged Childrens Portrait Photographer Bury St Edmunds, Christmas Mini Session, Christmas Photographer Suffolk, Toddler Photographer Suffolk. Bookmark the permalink.